premium Wax & glass &cement. Excellent Proudct to decorate table centerpieces and they are simple and elegant with any of your holders. Best product for wedding receptions, prayer, dinner parties, holiday gatherings and other events. look beautiful and realistic. 4H : 4 hours lights up, 20 hours off, automatically turn on at the same time on the next day. 8H : 8 hours lights up, 16 hours off, automatically turn on at the same time on the next day. Quality guarantee: Full of Products Pass the CE verification. Products in full compliance with the ROHS and CE standard. Please contact us first. We always be here for you! Create Your New Environment Now! • SAFE!!! Our candles are smoke-free, flame-free, and heat-free. Providing peace of mind and safety without the associated risks of traditional candles. Flameless Candle doesn't have an open flame and it doesn't heat up during usage. • Applicable Users: Anybody. Our candles provide perfect results for those suffering from COPD, smoke allergies or hypersensitive asthma. 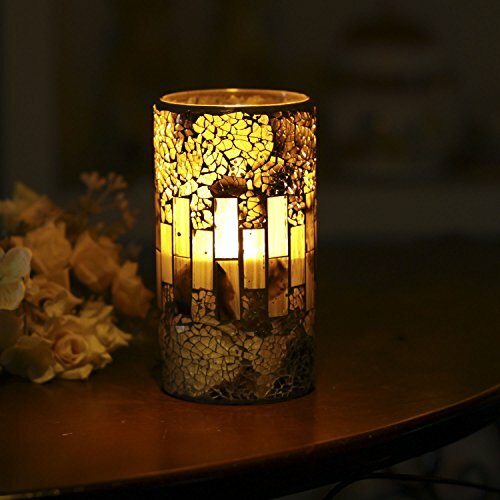 Very easy to use, these candles can be turned on and off by the flick of a switch. • Use For Occasions: Ambience, Holidays, Romance, Celebrations, Events, Mood, Restaurants & Bars, Churches, Weddings, Mantels, Dinning, Meditation, Gifts. ARE YOU PLANNING A PARTY OR WEDDING? -- Unique and unchained cracked mosaic glass design style. Made with high quality wax and mosaic glass that include a 4&8 hour timer. . .they are perfect for Weddings and Parties. . .or a quite evening for two. Now prepare to enjoy a party in the candlelight. . .
EASY TO USE TIMER -- Just set the timer to illuminate the candle at the same time every day. The switch on the bottom of each candle allows you to set the 4/8 hour timer glow, automatically turn on at the same time on the next day. It toggles: Off/Timer for easy & convenient operation. Electric fake pillars which make a great gift for teens, seniors and anyone that love candles 4&8. PEACE & COMFORTABLE -- Enjoy all the benefits of traditional candles and none of the negatives! No more dripping-hot wax, no more smoke or worry about falling asleep without blowing out the candles. Blinking slowly, like a real candle flame, it won't have any scent, create romantic and peaceful private environment for your time. SAFE & CLEAN -- We care about your safety, and a risk of fire shouldn't be a concern. It is safe pass the CE verification. It is smokeless and without dripping wax. So that you don't worry about the cleaning problem after a happy party. What you need just enjoy the happy time with your friends and families. PERFECT DECOR -- Most fashion ideas to use these LED candles in your home as decorations and candles! You can hold it in your hand to pray and even in big church or holidays to show your sincere. Can be used before dinner and other Thanksgiving Easter and Christmas festivals. It will bring Surprise and happiness to you and your friends. View More In Specialty Candles. If you have any questions about this product by GiveU, contact us by completing and submitting the form below. If you are looking for a specif part number, please include it with your message.